As a dietitian who spends considerable time thinking about children’s’ health, there is no doubt in my mind that key to a lifetime of healthy living is combating childhood obesity. Depressing results from a recent study on contestants in the popular television show, The Biggest Loser, reinforce that knowledge. The study, featured in The New York Times, looked at contestants of the show’s season 8, following them for six years after the program. Findings that showed nearly all the showing contestants gained considerable weight led to surprising new discoveries about the physiology of obesity, explaining why so many people struggle unsuccessfully to maintain weight loss. The study shows discouraging results for adults, but as a pediatric dietitian, it left me even more determined to encourage weight loss for children, who are still growing and whose metabolisms are not set. As childhood obesity becomes even more prevalent and the medical complications resulting from it becoming more known and severe, it’s crucial we help reverse or combat these issues. Reduce liquid calorie intake. Our bodies don’t regulate liquid calories the same way they do with calories from solid foods. It can be surprising to families when they realize how many calories they may be consuming from liquids. Switch to skim or 1% milk, eliminate juice and soda and even most sports drinks. If you absolutely cannot eliminate juice and soda, try alternatives like Crystal Light or diet soda. Also, don’t believe the hype behind sports drinks marketing! There is almost no need for children to consume sports or electrolyte replacement drinks. If games or practices last for less than 60-90 minutes, your child will be fine drinking water and having a healthy snack afterward. Avoid distractions during meal and snack times. Have your child turn off the TV and put away books or activities while eating. Some of these activities may contribute to “mindless eating” and your child will eat more than a normal portion without thinking about if they feel satisfied or full. Try to have family meal times where everyone sits down and eats together and is able to share parts of their day. Wait between first and second servings. It can take up to 20 minutes for our brain to register that our stomach is full. If your child eats quickly and then immediately goes back for more food, he or she may overeat before realizing it. Have kids wait 10-15 minutes and encourage them to have a glass of water in the meantime. If they are still hungry after waiting for 10-15 min, then allow them an additional serving. Keep snacking to a minimum. Snacks between meals should be no more than about 150 cals. Examples of this would be a piece of fresh fruit, a cup of low fat/sugar free yogurt, 1 string cheese, or raw vegetables with a low cal dip. This will provide the energy your child needs to make it from meal to meal without overeating. Encourage physical activity every day. If your child does not participate in organized sports, try going for walks or bike rides together as a family. If you can’t get outside, you could dance indoors, set up an obstacle course or walk up and down stairs. Carmyn is a registered dietitian with Feed to Succeed, who also works at Lurie Children’s Hospital. Read more about Carmyn. There is no shortage of warehouses full of bounce houses in the Chicago area, and when the weather is nice around here, there are loads of parks. But places for older kids to run around and play hard are all too rare. That’s why I am so excited to introduce The Zone in Mount Prospect to you. 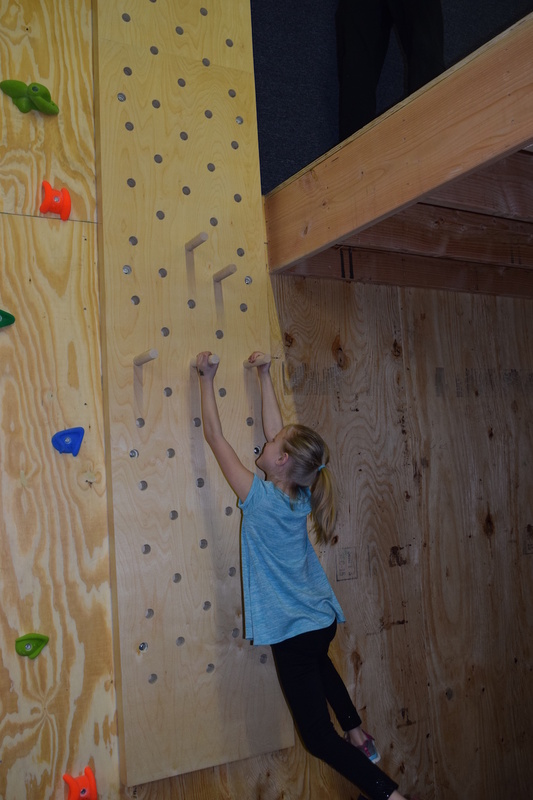 It’s an indoor parkour space, which is a free-form style of tumbling, jumping, running and hurdling over all kinds of obstacles. My kids and I got to join their soft opening on April 9 and were so completely wowed by the space–full of big, bold and creative equipment ideal for older kids and teens (and adults who are still kids at heart!). For an 1.5 hours, my kids played hard—as in completely sweaty-they-didn’t-even-realize-they-were-exercising kind of playing. They were lost in a climbing maze, scaling a wall, running up high ramps, flipping over mats, flying into a foam pit and trying all sorts of fun, physical challenges. Think of Ninja Warrior-lite, and you’ll get the idea. The Zone officially opens on June 4, and will offer classes, open gym and birthday parties. The goal, says Bret Fahnstrom, executive director of the River Trails Park District, is to offer something adventurous, cutting edge and different. As far as he knows, The Zone is the only indoor dedicated parkour space in the state. Parkour programs include running, jumping, catching, rolling, flipping, tumbling, martial arts, strength training and more. While we don’t recommend that parents act as short order cooks, sometimes a few tweaks can keep everyone happy with dinner just the way he or she likes it. Burrito night lends itself to so many variations. With the same set of ingredients that only took a few minutes to prepare, we came up with three different options: burritos, nachos and taco salad. Your kids can each make their own finished product. Happy Cinco de Mayo! Saute the onion and garlic in a pot until lightly browned. Add the beans with 1/2 cup of the water. Cover and simmer until the water evaporates (about 15 minutes). Mash the mixture with a fork. Saute the Tempeh in olive oil and spices. Place a tortilla into an oven-safe bowl and broil for 2 minutes. 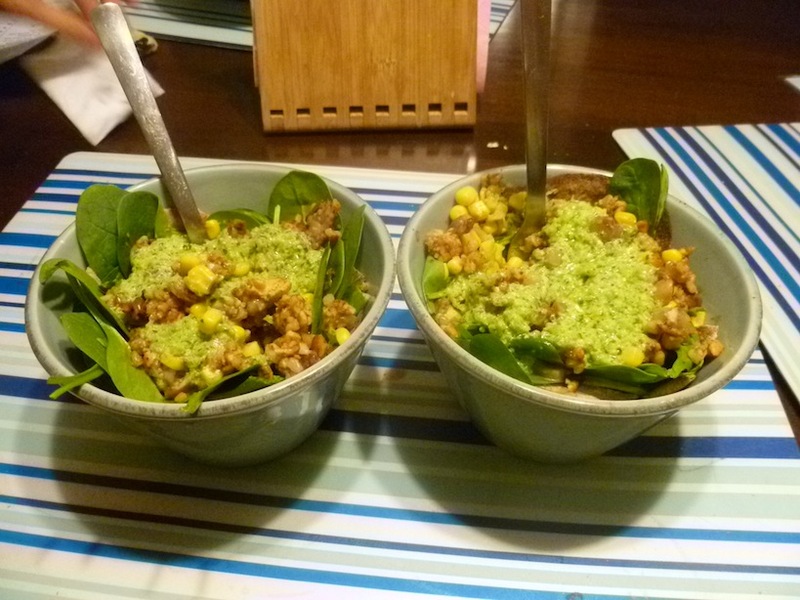 Set out tortillas, tempeh, beans and rice, fresh spinach, cheese, salsa and any toppings you like: corn, tomatoes, green onions, avocado, sour cream, etc. Everyone makes their dinner to suit.